"One of the coolest things is how supportive and happy and proud he is of my success lately. I'm with someone who is totally secure in himself. He's not trying to be anything other than what he is. The confidence he has brings it to me. "We're by no means freaky-deaky, but let's just say we're open to things. We're very okay with PDA. When we go to a restaurant, he loves when I wear a dress so he can do some upper-thigh rubbing. I would love to see more husbands and wives making out!" she told Cosmopolitan magazine back in April 2014. "I started to fall in love with her over the phone because she is so good with those 140 characters. She's so good and she's so clever," John told ET. "And I started to see that right away with her, and I was like, 'Wow, she's really impressive.' We were texting a lot, and I started to see her sense of humor. We would talk on the phone, and I just started to fall in love with how engaging and witty and funny she is. And I think that's when I really started to know that this was the kind of person I want to be around a lot. Once we started spending more time together between tour stops and all this other stuff, we realized we had such a connection—and then it blossomed into marriage and a baby!" "The short marriages thing is just insane to me. I mean, I can't even imagine ever not being with you now." 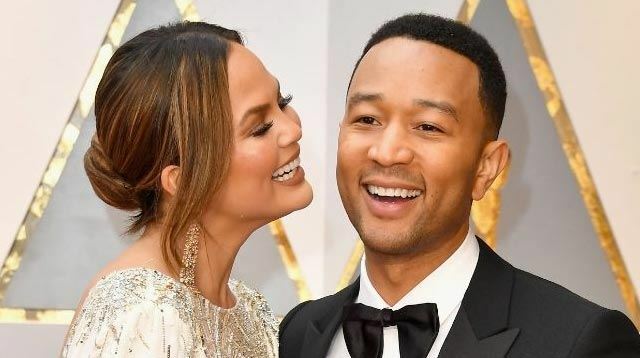 Chrissy said during a joint interview the couple did together with A Drink With. John added: "Right, I can't imagine my life without you either. I have reached the pinnacle of the perfect girl for me… You really just have to decide that you're not going to get divorced and then make it work." "It's inspired by Chrissy. She loved it and she cried when she first heard it," John told CBS. "I sang it to her. I just whispered it to her when we were at home. I wasn't even at the piano. I was just, like, excited about it. I didn't even have the recording yet. It was late and I was like, 'You just have to hear this song,' and I sang it to her and she just started crying." She jokes to Huffington Post: "The first line of it is 'What would I do without your smart mouth?' so if that's not about me I don't know what is." "I'm glad she wrote about it. I think it was powerful for her to let a lot of women know they're not alone, and no matter how much money you have or fame, anybody can feel that. And it's hard for anybody no matter how successful you are and how many resources you have. "For me as a husband, it was my job to do the best I could to support her and understand what she was going through and do whatever I could do to help her," he said. "I feel like that's the least I could do." "[As a man] you don't know internally what it feels like. You should read about it and understand what it is and really just be there to help. You need to be present and you need to be compassionate. And we're all learning and trying to figure it out as we go. At least do that and try to figure it out together." Speaking to Oprah about his super romantic personality, Chrissy gushed: "He's such a romantic all the time, like, literally, we would just go up to the Berkshires or something and he would say, like, 'Let's ride bicycles to the lake' or 'Let's go up to the rooftop and have a glass of wine.'" "Another year with you has flown by and I am so proud of what you've accomplished. Every year, I wonder how things can even get better but you always find a way. Happy *37th* birthday to the most wonderful, hard-working, loving being I, and anyone who has ever met you, have ever known. We love you, my handsome old man," she wrote on Instagram. 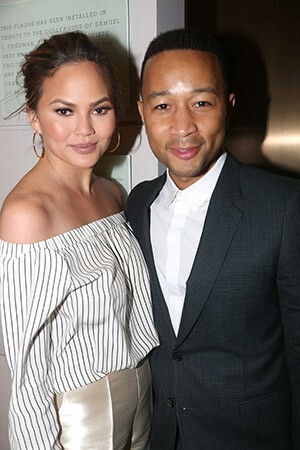 When introducing his song "You and I" on stage, John dedicated it to Chrissy and said: "This song is called, 'You and I.' Sometimes you have to let your loved one know that they're special. When I wrote this song I was thinking about when Chrissy and I go on date night, and sometimes there's all this pressure to look so good, and everyone's going to see you. But this song was just letting her know that before all the makeup and all those fancy clothes, she's already perfect in my eyes… It's called "You and I"… You fix your make up, just so… Guess you don't know, that you're beautiful. Try on every dress that you own. You were fine in my eyes a half hour ago."